I have just published the updated Foreign Baby Face Dolls pages. I have done some corrections and also added a new picture to the Canadian page. 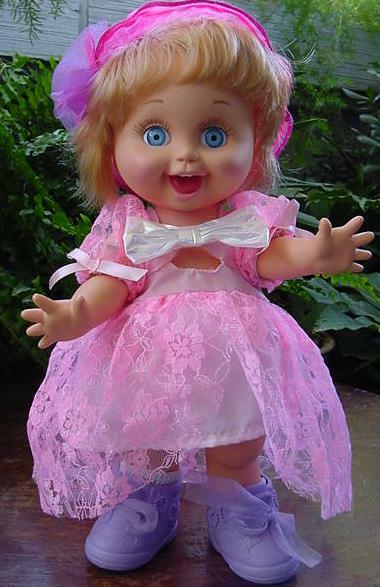 I was the first collector to discover back in 1996 that the Canadian dolls outfits were different than other Baby Face because of the use of lace fabric instead of the organza. Probably had something to do with the Canadian import laws, but that is just speculation. What I know for sure is that the Canadian outfits are a cool looking variations and fun to see. There are pictures of the Cynthia who was my first Canadian doll and how I discovered this variation in the fabric of these dolls and also Dee Dee, Laura and Penny. Also pictured is the Canadian mail away Party Dress, which is a favorite of mine and may not be found all that often these days. The newest addition is a picture of an example of the Canadian Ball Gown. Have you ever seen one? This outfit seems to be very rare. I only have this one picture. I would love to have a better one, which would show the outfit complete with the pink shoes and the headpiece. So if you have this dress, please send us a picture of it that we could put on the page about the Canadian dolls.